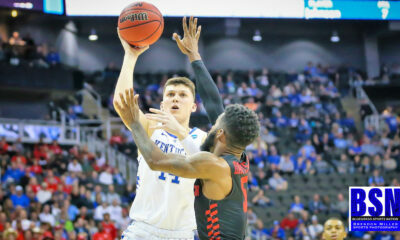 CATS Defeat Kansas 71-63 in SEC – Big 12 Challenge. Kansascame into today’s game ranked 9th in the latest poll and had a 16-3record. Kentucky was the third top-ten team that the Jayhawks played thisseason and they won their previous two before tonight. Kansas has been trendingdownward in the past few weeks. After winning their first ten games and beingranked #1, they have went 6-3 over the past 9 games. Kentucky, however, hasbeen trending up. The Cats have went 8-1 in the last 9 games and are on a fivegame win streak. The gamestarted off very slow for the Wildcats, they weren’t able to make a basketoutside the paint. It allowed Kansas to go on an early 12 to 0 run and pullahead of the Cats by 10. However, the Cats were finally able to make somebaskets and go on a run themselves pulling within two with 5:15 left in thehalf. The half ended with Kansas leading Kentucky 33-30. Shootingwas a problem for the entire first half. They shot a terrible 33% and missedall eight of the first half threes. 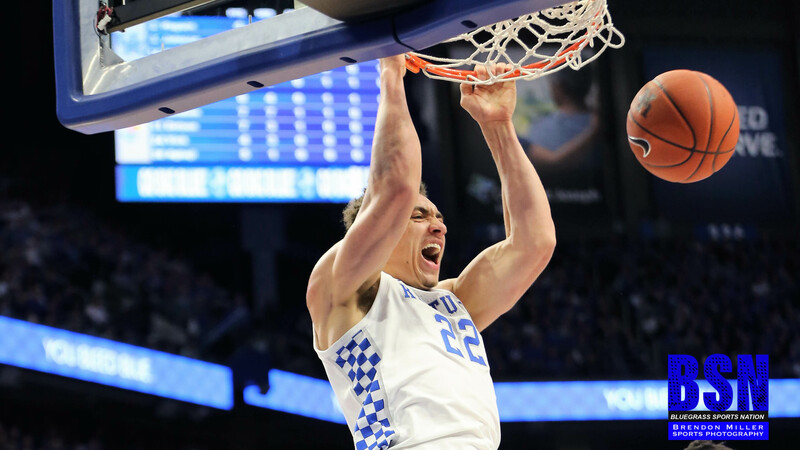 Reid Travis was the star for Kentucky inthe first half. When it looked like the Jayhawks were going to pull away, hewas able to score. Travis ended the half with 12 points and 6 rebounds. P. J.Washington grabbed 9 rebounds. Thestart of the second half was a much better performance for the Wildcats. Kentuckyscored the first 5 points of the half to take the lead 35 to 33. The Cats’second half defensive effort was much more aggressive and didn’t allow theJayhawks to score for 2:30 and allowed the Kentucky to go on a 8-0 run. Therest of the game was back and forth scoring, with the Wildcats holding a slightlead over the Jayhawks. It wasn’t until Keldon Johnson hit a three-pointer with3:15 left in the game that put UK up 9 that the fans in Rupp Arena feltcomfortable about the win. 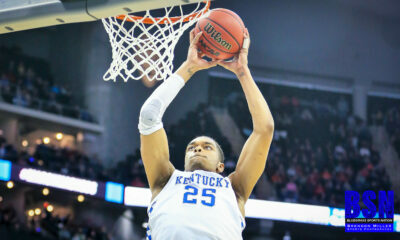 Kentuckyheld on and defeat Kansas 71 to 63. It if wasn’t for the great play tonight byWashington and Travis, the Cats may not have pulled this one out. On a nightthat the outside shot wasn’t going in they were able to control the paint. Theycombined for 38 points and 25 rebounds. Washington had 20 points with 14 ofthem coming in the second half when Kentucky needed to close out the game. Overall this was another terrific win the the Wildcats. It was the third time in a row defeating a ranked opponent and they looked good in all three games. The Cats will travel to Vanderbilt to take on the Commodores on Tuesday night at 9 p.m. The game will air on ESPN. Thanks to First National Bank of Jackson for sponsoring our Coverage of the CATS!!!!!! Watch Coach Calipari’s post game press conference here.